When children are removed from their homes due to allegations of child abuse and/or neglect, a complex process is triggered. The goal of that process is straightforward: ensure a safe, permanent home for these children who have been through so much. But attaining that goal involves a large, diverse group of participants including the attorneys who are prosecuting the parents; the biological parents, the lawyers who are defending them and the parents' partners; foster parents who often are related to the biological parents; social workers whose job is to work with the parents to improve their ability to parent while also assessing their progress; and representatives of the children, such as guardians ad litem. Communication about what is in the best interest of the children is paramount, but with so many perspectives involved, it is extremely difficult. Child protection* mediation is designed to bring together these differing perspectives and provide a forum to work together to chart a path forward for the children and their families. In some jurisdictions, the children may even participate in part of the mediation, depending on factors such as their maturity and the allegations involved. RSI is committed to bringing to bear our mediation expertise to help children who have been mistreated. We bring an interconnecting web of services that mesh together to improve the quality of all the services. For example, the research we did for our 2004 Cook County evaluation supported our 2016 Kane County program development and ongoing administration. What we learned operating our Kane County program informs our 2017 evaluation of child protection in the DC courts. We brought all those experiences into the development of our advanced mediator training. We will continue to share what we know in our Resource Center. 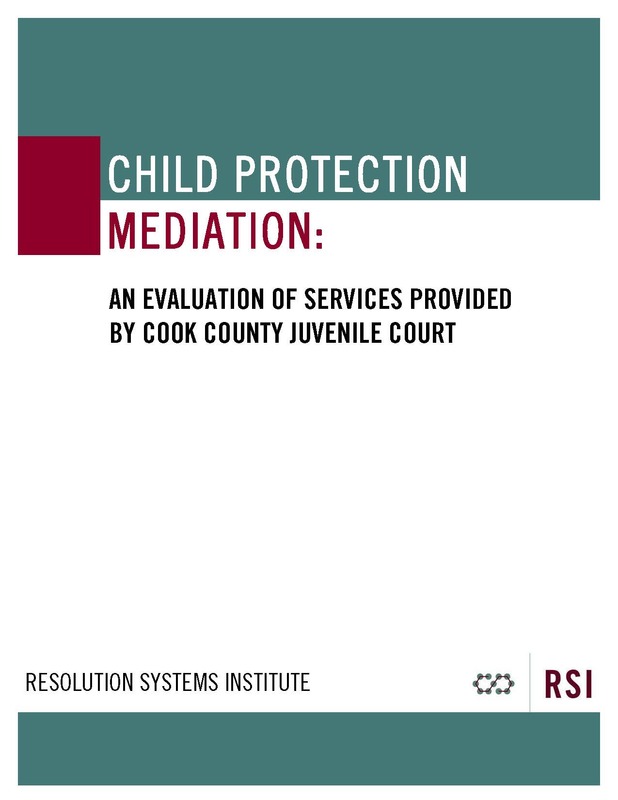 RSI has been involved in child protection mediation since 2004 when we were selected by the Cook County (Ilinois) Juvenille Court to evaluate their Child Protection Mediation Program. The evaluation, published in 2010, examined the process, outcomes and participant experience of the mediation program over a one-year period. The study included data from 164 cases referred to mediation, as well as interviews of mediation participants, judges, attorneys and program staff. Recommendations, including instituting an early referral process, were adopted by the Court to improve its services. In 2016, the District of Columbia awarded RSI a contract to evaluate its Child Protection Mediation Program. We are in the midst of conducting this comprehensive evaluation, which examines the effect of mediation on the amount of time a case is open, how parents and professionals experience mediation, and any ways in which the process can be improved. The evaluation process includes surveys of all participants, interviews of parents, and observations of mediations and court hearings. We are also conducting focus groups with stakeholders and analyzing program data. This evaluation is expected to be completed in 2018. In 2016, RSI worked with Illinois’ 16th Judicial Circuit (Kane County) and an array of local stakeholders to establish the Kane County Child Protection Mediation Program. This program is generously supported by the Illinois Equal Justice Foundation, the Court Improvement Program* and the Illinois Bar Foundation. We owe much to the judicial leaders in the 16th Circuit, who spearheaded the development of this program. RSI worked with them and other stakeholders -- from the prosecutor's office, local social services agencies, the state's Department of Children and Family Services, defense attorneys, and Court Appointed Special Advocates (CASA) who represent children in the mediations -- to develop the local court rule governing program administration. Upon receiving approval of the court rules from the Illinois Supreme Court, and securing funding to launch an initial pilot phase, RSI was thrilled to be involved with just the third active child protection mediation program in the state of Illinois. We set out to develop an advanced, two-day mediator training (see below) which we held in January 2017. In our program, each of our ten dedicated and skilled volunteer mediators mediates alongside our Mediation Program Manager, Kevin Malone. RSI believes co-mediation is the preferred method of managing these sessions, as the multi-party, highly emotional dynamics of child protection cases require greater facilitation and attention than one mediator alone can readily handle. From the earliest days of the program, RSI has been able to bring parties together to work out plans for biological parents to visit their children in foster care; to improve understanding between social workers and parents about the services parents need to accomplish, such as parenting education and drug treatment; to talk about the children's educational progress; and a host of other issues. Over time, RSI's objective is to reduce the time it takes for children to have permanent, safe homes. *In September 2015, the Illinois Equal Justice Foundation awarded Resolution Systems Institute $40,000 to develop the pilot Child Protection Mediation Program in conjunction with the 16th Judicial Circuit Court of Illinois in Kane County. That funding was supplemented in July 2016, when the Illinois Bar Foundation awarded RSI $5,000 to support the program’s mediators. Most recently, for the 2018 fiscal year, RSI has been awarded $40,000 from the Administrative Office of the Illinois Courts’ State Court Improvement Program. Overall, $40,000 of the Kane County Child Protection Mediation Program’s $50,000 budget (or 90%) is federally funded, with the remaining $10,000 (20%) coming from nongovernmental funding. In January 2017, RSI conducted our first advanced training for child protection mediators in preparation for the launch of our 16th Circuit program. The two-day intensive training, designed for experienced mediators and/or those with considerable exposure to the child abuse & neglect court process, employed a combination of lecture, group exercises and an interactive role-play and demonstration of a simulated Child Protection Mediation. To develop the training, we drew on national and local experts in child protection, as well as our own training experience. We are especially grateful to California's Administrative Office of the Courts for sharing their Juvenile Dependency Mediation Curriculum. One of the highlights of the training was the simulation of a child protection case in which the roles were played by the actual professionals who handle these cases, including attorneys, caseworkers and Court Appointed Special Advocates. These great roleplayers gave the trainees a high level of authenticity and insight into the parties' motivations. "Actually observing a mediation step-by-step was very helpful." "It was great to learn from professionals." "Interactive exercises were helpful to get...'hands-on' experience"
Thanks to generous support from the Illinois Bar Foundation, we are able to put on monthly educational programming to bolster the mediators' skills and build rapport with one another. These Lunch and Learn session have covered topics such as effective use of separate meetings/caucus sessions in the child protection context and working with victims of intimate partner violence. RSI is available to conduct our training for courts across the country. Interested in learning more about our child protection mediation training services? Please email RSI Associate Director Eric Slepak-Cherney.